Most pastors don’t need to be resourced. Instead, we need to be released to pursue the vision God has placed on our hearts. The Bible is rather clear about our position in Christ. We know from Genesis that every human being is made in the image of God and blessed with tremendous authority, capacity, and capability. We are given the power to be fruitful, to multiply, and to have dominion. Consequently, we are very dangerous when left to our own devices. The good news of the Gospel is our rebellion has been defeated through the cross. Jesus Christ judged my rebellion by taking my punishment. The cross is my punishment and my freedom. Now that I’ve accepted Christ’s offering as my righteousness, I am no longer defined by my rebellion. Instead, my life is now hidden with Christ. I died when I accepted the cross. I no longer live, it is Christ Jesus who lives in me and through me for His eternal purposes. The Holy Spirit testifies to the reality of my new existence in Christ. The Holy Spirit testifies to the fact that I have indeed been made righteous through the death and resurrection of Jesus Christ. The Holy Spirit dwells in me, because the righteousness of God has forever cleansed me. Therefore, when I walk into a room, the light of Christ enters the room with me. In Christ I am now a Spirit-filled person of authority; still made in the image of God, still having the power to be fruitful and multiply, and still being able to exercise dominion. However, now that my rebellion has been defeated, I am free to pursue a path that is rooted in the perfect will of God. This might seem like a refresher in Christianity 101, but I believe it is important to revisit this reality when considering my role as a pastor. In recent years, the church growth movement has tried to systematize the advancement of God’s Kingdom through viewing the church and church leaders as problems to be fixed. Consequently, a whole industry of “fix the problem” material has overtaken much of what used to be dedicated to spiritual formation. Much of this “fix the church” material works from the premise that we struggle because we lack what is needed. The list of what we lack seems endless. We lack vision, purpose, mission, and values. We lack the right people on the bus. We lack the right discipleship process. We lack visitor parking signs. We lack the right teaching, preaching, or music style. We lack! Consequently, we are being forever resourced by the latest and greatest leaders of our time. I don’t believe most pastors need resourced. I think we have more than we need to carry out God’s purposes for our lives. Every pastor needs to be released to pursue the passion God has already placed on his or her own heart. When I first entered into “official” ministry, I thought I had to grow a large church before I could be taken seriously as a leader. One particularly frustrating ministry experience led me to question this assumption. It was a Sunday afternoon and I was alone, sitting under a tree next to our Church’s community center. At the time, I was tremendously disheartened by the seemingly small size of our congregation. Regardless of my efforts, we couldn’t seem to grow beyond about 100 people in attendance (including crying babies and anyone else who had a pulse). As I sat under the tree sulking about my inability to grow a church, I began to argue with God about the frustrations that were warring within me. It was at that moment I began to realize that I had put false limitations on God’s plan for my life. I had bought into the notion that I had to be “somebody special” in the eyes of the world before I could do the special work God had entrusted to my care. I had fallen into the lie that I did not have what was necessary to do what God had so clearly put on my heart. From that day on, I decided to simply follow the Spirit and let God defend the worth of my decisions. Consequently, my life doesn’t really look like any of the models of ministry I’ve been told to adopt. I’m a writer, radio host, professor, pastor, evangelist, and dreamer. Most importantly, I’m free to follow the leading of the Holy Spirit. God is my worth, God is my defender. I don’t need to measure up to anyone or any system of leadership. The cross of Jesus Christ has become my worth. I am free to pursue my Savior. And so are you. I don’t think you need to be resourced. . . I think you just need to freely follow the dream God has placed on your heart. And if it helps a little, I want you to know that I’ll be your number one fan as you boldly pursue the path less taken. You’re released, now go have some fun advancing the Kingdom. You really hit a chord for me, both on Wednesday night and in this post about the over emphasis on “fixing” the church, the pastors, the people. 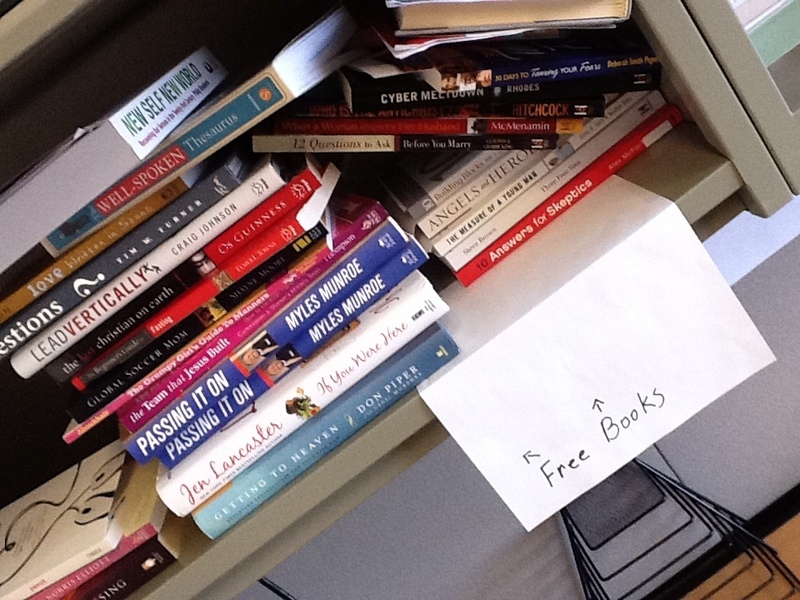 And I am especially inspired by the photo of free books to give away. What a release! hmmmm…. Thanks, Doug! Great thoughts, Doug. You’re really did a great job of putting to words what I have felt and thought for some time. Thanks for the permission to just go be me. Wow! What liberty, what joy, what peace. We are called to be disciples who make disciples, not professional pastors who build big organizations. If we have the Spirit in us and a willing heart (obedience) we have EVERYTHING God needs to accomplish His will on earth though us. Home run! Thanks for sharing! Really appreciate you Doug. You are a good man. Thanks Billy! Appreciate you as well.